The text is at the end of the chapter. The site : http://cyberneticzoo.com/?page_id=164 is comprehensive. Centipede walking Machine of Meredith Thring, 1967, from Australia and England, walked by modification of wheels and chains. From http://cyberneticzoo.com/tag/meredith-thring/. Mavag-Fiat 'Mocher Wagen' with feet, 1923. Rear wheels were replaced by a 'feet propulsion'. It was a scale model made by brothers Haris who run the Haris Automuseum in Budapest, Hungary. Pict and text are from Wheels and Tracks N° 61 about 1998. The author saw also at Rétromobile in the mid 2000s another WWI period walking vehicle on a movie of the 1910s, but unfortunately unknown. Alzetta's Mechanical Horse in Mechanix Illustrated, Apr 1933. Product of an Italian inventor, Alzetta, was said to run on road or off-road with equal ease. Many thinks show that it was not a true walking machine too complex for this time and was a hoax. http://gurneyjourney. Bipedal Walking Machine of the 70s, from Russia. Phony Pony, 1968, by Frank and Mc Ghee, University of South Carolina, before existence of microprocessors, but with a computer. Raibert's Quadruped robot, 1985-87. By coupling the legs, the quadruped successfully executed trotting (diagonally paired legs), pacing (lateral pairs), bounding (front pair and rear pair) and several transitions between gaits. From Carl Reeves Thesis, Mc Gill University, Montréal, 2002. ARS Robots for Ambulatory Robotics Laboratory of Pr Martin Buehler created in 1991. It exploited elastic mechanical devices to reduce power consumption. They achieved dynamic walking, bounding, turning and step climbing. From L to R and U to D : ARL's Monopod II 1996, ARL's SCOUT I 1997, ARL's Scout II 1998, ARL's Scout II with passive knees 1999. From Thesis of Carl Reeves, Mc Gill University, Montréal, 2002.
easier in dust. Legs were moved by mechanic springs which contract and extend under the action of an electric current. A simple concept. Pict from 'Science et Vie', Sept 1999. Russian walking robots were in Russian hobby magazines from late 60s to mid-80s. This is one model. 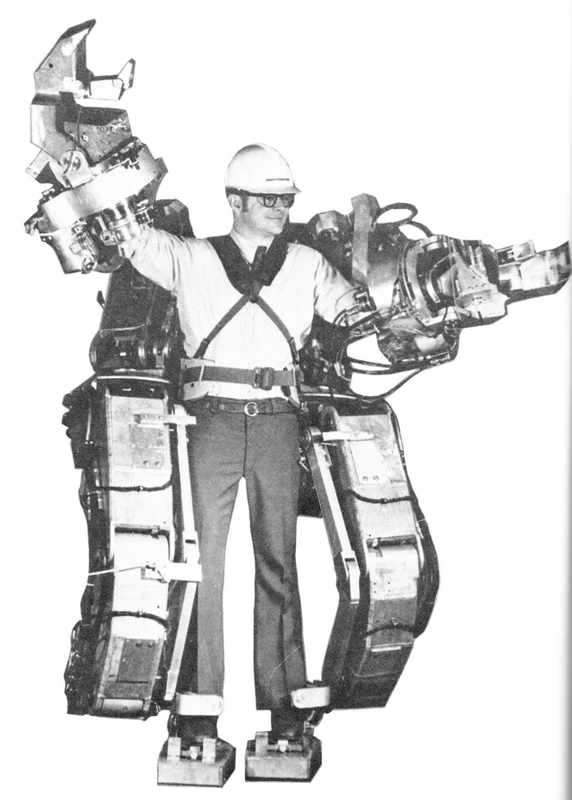 Robot of Robert Mc Ghee, 1982, University of Columbus, Ohio, 6 legged vehicle, of 103 kg. One of the few existing prototypes in the world at that time required complicated mechanisms managed by a fledgling computer. Ambler robot, 1988-91, of John Bares & William Whittaker of Cargenie Mellon University and Jet Propulsion Laboratory. Very tall height 5 to 7 m, mass 2500 kg, speed 35 cm/mn, it was built for planetary exploration (steep slopes rocks, crevices) and has proved its off-road capabilities. ODEX-III walking robot using screws in legs. This robot has been modified and renamed Sherpa by the French Energy Commision. Odex II, with a manupulator arm, was sold to Savanah River Labs. Pict of Eric Rabinowitz on Picasaweb. Sherpa robot of CEA of Fontenay aux Roses in the 80s. It came from Odetics Company and was modified. Payload 300 kg, The six telescopic legs could be lengthened or shortened thanks to screws and upper part was always level. In 1998, Sherpa had 60 hours of work. It could up and down stairs of 45° and cross walls of 60 cm high. Polybots Modular robots of Palo Alto Research Center in 2002. In the multiple configurations, one of them, the G2, can walk. Asterisk Robot, 2006 crossing a step from youtube. ANT I, early 90s, from DRES, Alberta, Canada, was an articulated vehicle with driven legs. It was conceived for stepping, bridging or crawling. From pdf of Carl Steeve. Articulated Navigation Testbed ANT II, late 90s, used powered wheels at the end of powered legs. By lifting a leg over obstacle, ANT could traverse extreme terrains. From DRES, Alberta, Canada. Adachi's Walk'n Roll, 1999. The wheels at rear were driven. Wheeled leg Hylos robot built by Christophe Gand of Laboratoire de Robotique de Paris in 2003. See chap 'Wheeled robots and Lunar cars'. Wheel-legged chariot seen on the Internet. Hopping Boots of Sergei Antonov, University of Ufa. Mass 2 kg each, engine with kerosene heat air in a piston and makes hoops of 1,5 m. Range 25 km. Pict Science et Vie Junior, June 2001. Bear robot drawing as it was conceived about 2007. Titan X, 2005, from S. Hirose can work on 4 legs mode for rough terrain or 4 tracks mode on relatively flat ground. 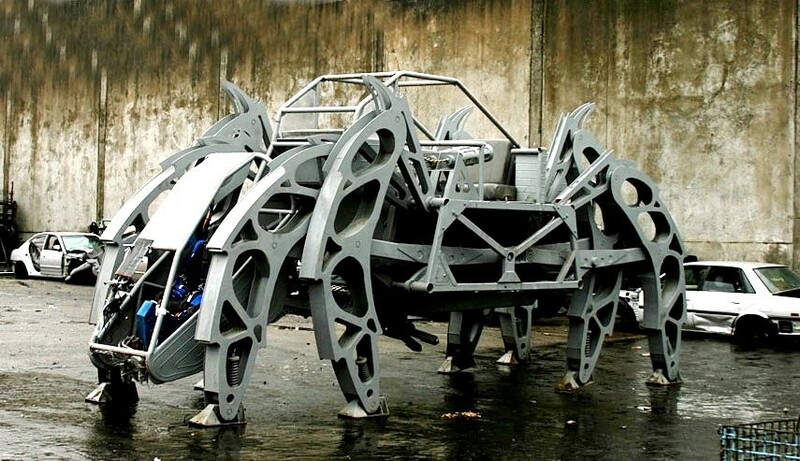 There are many studies about leg-wheel or leg-track hybrid mobile robots. Mass 29 kg. Walking trucks projects of General Electric was to be tested in the 60s in swamplands, mountains or on the Moon at 8 km/h with a 1/4 ton on its back. It was in mind of designers a really off-road vehicle. The Walking Truck will be built. Adaptive Suspension Vehicle (ASV), 1994, was developed by Kenneth Waldron & McGhee at Ohio State University from the late 80s to mid-90s. Unlike the Walking Truck, it used computers and scanning systems. Nevertheless, it was complex, heavy and expensive. The legs did not rise sufficiently over obstacles and oversized tires were equal or better. Pict from the review 'Science et Vie' Feb 1986. Man always wants to create machines to move in his own image or that of animals. Oddly, the old dream of flying like a bird materializes first. He wants also to build 'walking machines' featured with legs, like animals. His goal ? Be able to imitate the cat climbing on to the trees, the cockroach travelling spaces littered with obstacles or the ibex (photo 1) prancing on the mountain slopes. The idea is really to go places inaccessible to him, and his eyes, a legged machine, equipped with 'lever-legs' that can overcome obstacles, represents an ideal of mobility all-out. In fact, there is nothing in. For fifty years, the 'walking machine' models of one or more legs were built in the world. Unfortunately not in series ! Various reasons refer to heaviness, complexity and price, slowness, due among other, to the inertia of the legs, but mostly it is far from ibex on mountain slopes. Most of these human made walkers need a flat and hard floor. Some, presented here, are still able to overcome an obstacle, but it's not so easy : their detection system does not always collect 3D terrain information and the control system cannot drive all movements of the joints smooth. The most advanced of them, from Plustech Oy of John Deere & Company, the world's known Plustech Walking Harvester, now at Museum of Lusto, Finland, probably could not outclass its wheeled or tracked counterparts. Let us set aside for a moment walking machines and open a parenthesis to indicate the difficulty of manufacturers of wheeled or tracked off-road vehicles (such as Foremost) to sell their magnificent specialized vehicles for oil industry. The past decades, many companies have gone bankrupt or been acquired. The reasons are high price and expensive maintenance of these non-standard gears. Today, tankers have increasingly resorted to matting (for instance Strad Energy Services), kind of removable steel or wooden floor lay on the ground, allowing the use of more conventional vehicles. In the military domain too, all-terrain vehicles are fairly standard and if they have any problem of mobility, preparing site, the engineering opens up new tracks. Mention may also be made of the small 'rescue robots', used when searching in disasters, often competing in steeplechase racing of international 'Robocop', all equipped with wheels or tracks, not legs. It would therefore tend to do without very specialized vehicles, except in extreme conditions. As for the legged or hybrid vehicles, and may be latter snake-like, they will be nevertheless, with daily progress, the future of really off-road terrestrial or planetary locomotion, where the use of any other means will be impossible to reach by land inaccessible known places.